On a bright, sunny and hot morning Mohamed Temam gave up his pacing role shortly after halfway and eventually swept back past his fellow Ethiopian Abere Chane to win by over 200m writes Pat Butcher. Often unsung heroes, pacemakers have nonetheless often seized their chance to win, and Temam did so. He was supposed to pace to 33km but Chane struck out for himself after passing halfway in 66:01. He had run 61:47 earlier this year, and had predicted he would run 2:10-2:11. But running a faster second half was a tough task with direct sun making 22°C feel much hotter. At 37km my hip started to hurt he said, but it was probably speeding up by 10 seconds per kilometre that proved his undoing. Temam ran in in Chane's wake, then picked up the pieces when his colleague fell apart. Macharia fell away at 35km but finished a clear third. He made his most decisive move at the victory ceremony in extracting himself from the unwanted embrace of the huge Ethiopian flag that was produced for Temam and Chane. 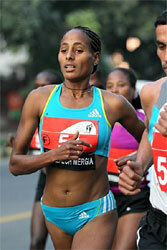 In the women's race Etaferehu Tarekegn lived up to her status as favourite. Leading a group of three at 30km she then began to push on, and by 37km was heading for an untroubled win. The new records anticipated in the eighth edition only materialised with a men's national record for Hussein Awadah in seventh place, taking five seconds off his previous record from Berlin 2008. Prime Minister Saad Hariri vividly demonstrated the unifying force of running. Son of Rafik, the former PM who was assassinated in 2005, he ran the 10km around the streets of the city centre. On a dull drizzly morning runners set off from the city centre for a scenic tour of the city's World Heritage waterfront. After a switchback first kilomete the course gently declines to meet the Atlantic Ocean, making for some fast early kilometres. A group of 11 quickly became detached, passing through 5km in 15:21. Passing 10km in 30:42 with the wind at their back and before turning into the sheltered Douro river estuary, there were eight runners together. It stayed that way as the runners crossed to the south side of the river by the low-level bridge and reached a turnaround point at halfway in 1:06:22. 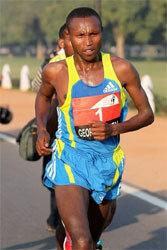 The pacemaker that dropped out here was before long replaced by Paulo Gomes, who joined the lead group at 25km. Back on the north side runners went further upriver for a short distance, making another turnaround just past 28km. The final pacemaker dropped out here, and Alex Kirui hardly hesitated in taking up the running. Passing 30km in 1:35:25 he quickly opened up a gap on Anthony Ndungu and Kimutai Keter, with Paulo Gomes trailing in fourth. While making his way northward along the Atlantic coast Kirui continued to go clear and passed 40km 65 seconds ahead — but he was ahead of Gomes, who had paced himself well to take second, and closed on Kirui in the final uphill kilometre. Beatrice Toroitich, fresh from a 1:11 half marathon in Rennes two weeks before and making her marathon debut in Porto, had the experienced Pamela Chepchumba for company over the first half of the race. Chepchumba, nursing a hamstring strain, had to back off significantly after 27km but still managed a visibly uncomfortable second place. Gibraltar, with a population of 30,000, is one of the newest IAU members but this was already the second major IAU championship it has hosted in as many years. Over 180 athletes representing 30 nations participated. Race day temperatures were ideal in the mid-teens Celsius. The race was run over 19 5km laps, with start and finish sections. Shinji Nakadai ran a cautious race, only taking the lead after 87km. Michael Wardian looked strong for most of the race but European Champion Jonas Buud after tracking the leaders in the chasing group moved up to join them at 75km before Nakadai made his move. Buud's pace was very good and I decide to follow him said Nakadai. After the race. Buud retained his silver medal position while for Wardian it was his third consecutive bronze medal finish in as many IAU races. A Masters event was held concurrently, in collaboration with the World Masters Association, with medals awarded in 5-year age groups. Over 13,600 runners from 19 countries started from the Jamsil Stadium with another 8300 in the 10km. 14 runners remained in contention after halfway, and by 30km only half that number remained, including defending champion and course record holder Jason Mbote, who trailed David Kiyeng, Mohamed El Hachini, Wegayehu Girma Tefera and Stephen Mokoka as they passed 40km. Kiyeng and El Hachimi fought to the line, with Kiyeng taking the win by two seconds and missing Mbote's course record by one. The women's race had no international field and of the three home entrants Eun Jung Kim proved strongest. She led Na-Ri Jin by over three minutes at 25km. Jin closed the gap significantly the next 10km but could get no nearer in the closing stages. The race was started by President of Piedmont region, Roberto Cota who set 2500 runners off from the start line. Ruggero Pertile posted the best time of the year for an Italian, while Priscah Jeptoo recorded the second fastest time ever, after Agnes Kiprop's course record of 2:26:22 set last year. She distanced herself from runner up Fate Tola in the final kilometres. Next year's race will be on 13 November. Nearly 6,000 runners, coming from 49 states and eight countries, enjoyed windless blue skies and bright sunshine. 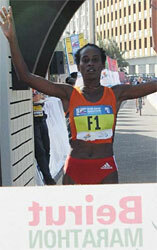 Fast times resulted, including that by 2008 winner Belainesh Gebre, who shattered the four-year old women's course record by more than two and a half minutes and finished eight minutes clear. In the men's race Macdonard Ondara and Kirui Kiprotich battled for the lead from the early stages and finished only seconds apart. Ondara, who also won in 2007, held a 50m lead through much of the race but had to hold off a furious finishing sprint by Kirui. The third edition incorporated the French Championships and started at 08:15 from the Promenade des Anglais in Nice to finish in Cannes on the Boulevard de la Croisette face to Palais Stéphanie. The invited elite started on the south side of the road with 600 national runners who expected to break three hours. The mass of runners gathered on the north side of the road. Two French runners Rachid Ghanmouni and El Hassan Lahssini were among the dwindling group of leaders and by 30km Mark Tanui, Hailu Shume and Botoru Tsegaye had the podium positions wrapped up. With 4km to go to Tsegaye put distance between himself and the other two, going on to win in a time just 10 seconds outside the course record set last year. The women's race was also dominated by Kenya and Ethiopia, as as Radiya Roba and Emily Rotich finished far ahead of the Frenchwoman Adeline Roche. The third edition was another great success with 11700 registrations including more than 250 teams for the Relay Marathon. The 4th edition will be on 13 November 2011. Ethiopian Aselefech Mergia found her kick again to regain the title she took two years ago and lead eight others under 69 minutes writes Ram Murali Krishnan. The men's pack splintered much earlier, but there was still less than a second separating winner Geoffrey Mutai from Lelisa Desisa. Geoffrey Mutai started the men's race as favourite but the tall figure of Silas Kipruto made much of the early running. Passing through 5km in 14 minutes the pace sped up significantly for a couple of kilometres, after which point it seemed as if the Kenyan pair wanted assistance with the pace from the Ethiopians Lelisa Desisa and Yacob Yarso. They slowed along the scenic thoroughfare of Rajpath, stretching from India Gate to the Central Secretariat buildings, and by 10km were back on par with a timing of 28:05, a lead of about 10 seconds. The tactical game began from about 14km, and the chasing group started to close up as Mutai continued to weave a path that suggested he was unhappy to lead. But with 300m to go he seized his chance and stretched out for the finish line to win by half a second. The winners took home USD 25,000 awarded by sport loving Delhi chief minister Sheila Dixit. Several distinguished persons from the corporate world attended and Bollywood actress Gul Panag took part. Rahul Bose, Maria Goretti, Arshad Warsi and 'Face of the Event' Bipasha Basu were there in support. Haile Gebrselassie flagged off a record number of runners for a road race in Africa on the streets of Addis Ababa. It was won in a relatively modest time as it came down to a fierce sprint among the top three over the final 200m, with Ameraw Bekele edging ahead. The women's eace was taken by Sule Utura. With 32,000 medals distributed at the finish and many more unofficial participants joining in, an estimated total of around 35,000 took part in the race, many walking round the 10km course which this year used a new route to cater for the larger numbers. Gebrselassie acted as starter for the race alongside Lornah Kiplagat, visiting Ethiopia for the first time from her home base in Iten, Kenya. 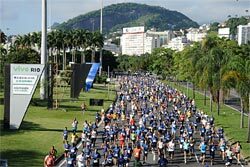 Starting from the City's Legislative Assembly thousands of runners took off for a tour of Sao Paulo's Ibirapuera district, filling the streets with a sea of blue. 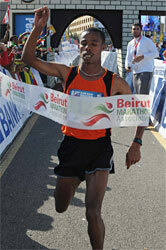 The first three finishers were Kenyan; Giovane dos Santos was the best local to finish. 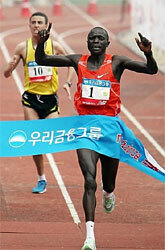 The winner, Emmanuel Kipkemei Bett, is coached by Luiz Antonio dos Santos, who won the first edition of the race. The Brazilian women fared better with a win from debutante Cruz Nonata da Silva. Finishers could observe their arrival on a video wall set up adjacent to the finishing line. After the race the party was completed with a show and many awards were made within the finish arena. The Pharaonic Race has ancient origins. In 1977 a stone inscribed with hieroglyphics was found that described a training run done by the Pharaoh's soldiers during the reign of King Taharqa who ruled Egypt from 690 BC to 660 BC. King Taharqa wanted a strong army and decided that they should make a training run from Saqqara through Memphis, Dahshur, Lisht, Meidum to the Pyramid of Hawara at Fayyum, a distance of about 100km. This was the 10th anniversary of the revived event, and attracted 28 nationalities. The race renews the Pharaoh's glory every year, re-enacting the same run that happened more than 2500 years ago. Everyone should remember the story and a replica of the stone should be given to the winner of the Race. Supported by the Ministry of Tourism, the race started at the Hawara Pyramid at Faiyum and finished at the Sakkara pyramids near Giza. The race started and finished in front of the 'Monument to Pracinhas' (a tribute to the expeditionary force during the Second World War), at Aterro do Flamengo. The women's race started at 07:45 with the men and the mass runners following 15 minutes later. The weather was sunny and warm (25°C). 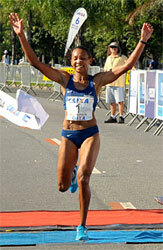 Cruz Nonata Da Silva scored a third victory over Kenyan opposition and shaved a second off the 2005 course record. 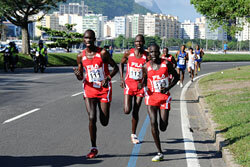 The Kenyans swept the men's podium.